The world's first railway roundhouse. 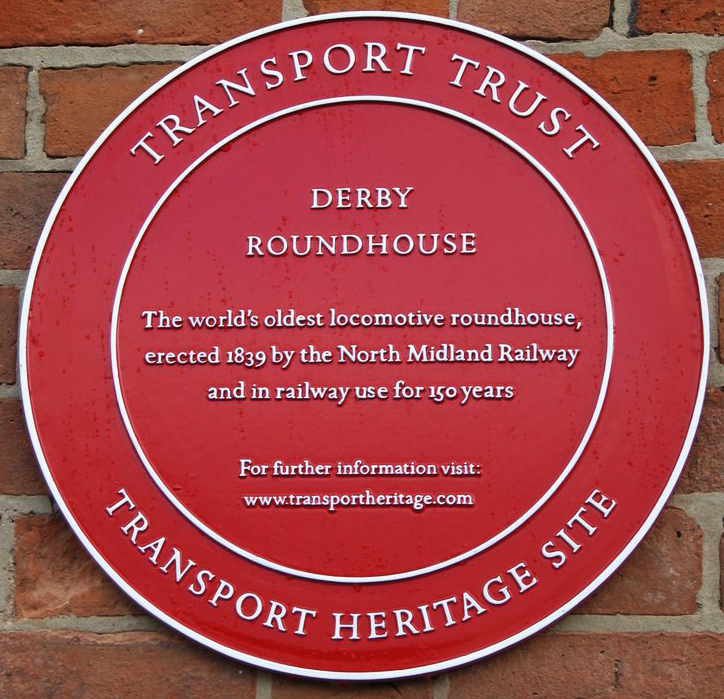 This is the world's first railway roundhouse, built by Robert Stephenson in 1839for the North Midland Railway. 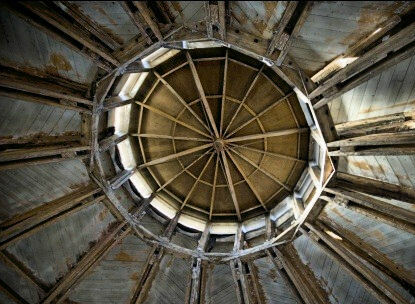 It was decribed on construction as "A polygon of sixteen sides, and 58m (190 ft) diameter, lighted from a dome-shaped roof, of the height of 15 m (50 ft). It contains sixteen lines of rails, radiating from a single turn-table in the centre: the engines, on their arrival, are taken in there, placed upon the turn-table, and wheeled into any stall that may be vacant. Each of the sixteen stalls will hold two, or perhaps more, engines." Early steam locomotives normally travelled forwards only; although reverse operations capabilities were soon built into locomotive mechanisms, the controls were normally optimized for forward travel, and the locomotives often could not operate as well in reverse. Some passenger cars, such as observation cars, were also designed as late as the 1960s for operations in a particular direction. A turntable therefore allowed a locomotive or other rolling stock to be turned around for the return journey. 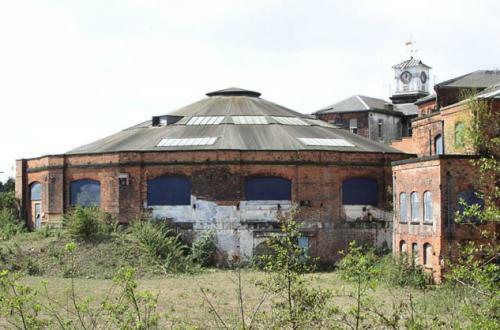 Located next to Derby Railway Station, the buildings were previously part of the East Midlands' thriving railway business.Attached to and integral with the Roundhouse are two buildings distinct within their own right. Firstly, The Carriage Shop, which as the name suggests, was primarily used for the manufacture and repair of railway carriages. 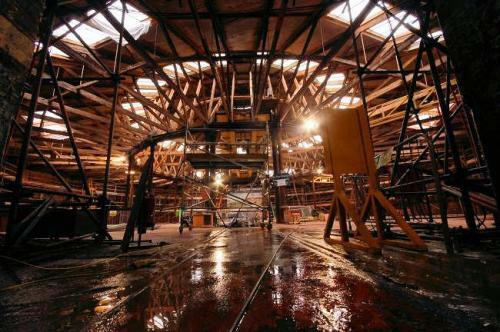 Secondly, there is an office complex which consists of three storeys of accommodation wrapped around the North West quadrant of the Roundhouse. In addition to this complex of three adjoined buildings, there is a fourth building which stands alone to the North. This is known as The Midland Counties Building or Engine Shop. 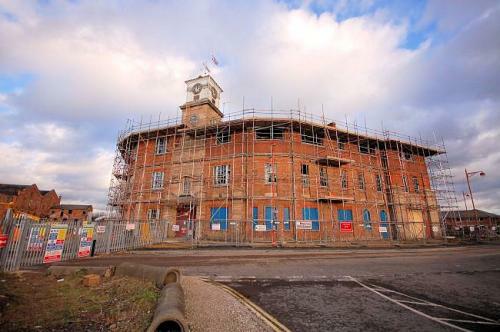 Having narrowly escaped demolition after the closure of Derby Railway Works, this Grade II* Listed Building has been sympathetically restored as the main campusof Derby College, catering for more than half of the college's 25,000 students. 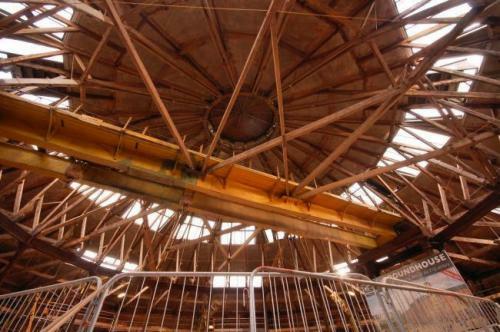 The last roundhouse still in operation in the UK is at the Barrow Hill Roundhouse Railway Centre.